Update 06/28/13: Videos of the talks are online. You can link to them from here, and here. Update 06/10/13: And it's a clean sweep for the Jacobs School of Engineering! GrollTex won first place in the Technology/Innovation category on June 7. UPDATE 06/05/13: DevaNano won first place, Wolf Biosciences won second place and Electrozyme won the audience choice prize in the MedTech/BioTech category. Four Jacobs School graduate students will be in the spotlight tomorrow during the finals of the UC San Diego Entrepreneur Challenge. 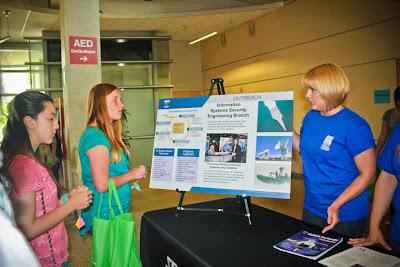 Inanc Ortac, who won second place back in 2011 and won the 2012 Collegiate Inventors Competition, is back. His company, DevaNano, plans to commercialize a nanoscale smart therapeutic drug delivery platform. It is capable of protecting otherwise immunogenic enzymatic payloads from the immune system while maintaining enzymatic activity. Ortac is a Ph.D. student in electrical engineering and a graduate student researcher at the UC San Diego Moores Cancer Center. Adam Young, a PhD candidate in bioengineering in Karen Christman's lab is part of Wolf Biosciences. According to Bruce Bigelow from Xconomy, Wolf Biosciences is "pioneering a novel approach to soft tissue repair and augmentation by using an injectable material just beneath the skin to encourage new fat growth." Joshua Windmiller, a postdoctoral researcher in the Department of NanoEngineering, is co-founder and CEO of Electrozyme. The company has developed proprietary temporary tattoo biosensors that measure the chemical constituents of the wearer's sweat. The first target application is sports performance and fitness monitoring. Ortac, Young and Windmiller are competing in the MedTech/BioTech category. Aliaksandr Zaretski, a Ph.D. student in NanoEngineering, is competing in the Technology/Innovation category. His company, GrollTex, has developed and patented a method to fabricate large-area graphene, transparent conductive electrodes inexpensively, locally and with zero waste. He explains the technology in this YouTube video. The first-place winner receives $20,000 in cash, as well as legal, brand development, tax consulting and credibility review services, as well as a one-year free membership to CONNECT. The second place winner receives $10,000 in cash and legal, tax consulting and credibility services and the free CONNECT membership. All finalists also are accelerated to the final round evaluation by start-up incubator EvoNexus. Click here for a complete list of finalists. Ramesh Rao guides UT San Diego reporter Gary Robbins through a demo of the Blizz Buzzer project. 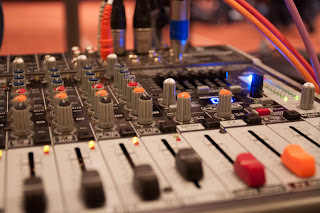 Keep up with the latest Bliss Buzzer happenings on their Facebook page or on the Bliss Buzzer twitter feed. Ramesh Rao is the Director of the Qualcomm Institute, as well as an electrical engineering professor at the UC San Diego Jacobs School of Engineering. 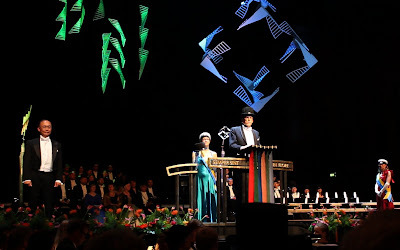 Electrical Engineering Professor Charles W. Tu has been awarded an honorary doctorate of engineering at Linköping University. At the UC San Diego Jacobs School of Engineering, Tu serves as Associate Dean and as a Distinguished Professor in the Department of Electrical and Computer Engineering. Over the past two decades, Tu has worked closely with researchers at Linköping University, Sweden (LiU). The research has focused on developing new electronic/photonic/spintronic materials. The work has resulted in over 150 joint publications and conference contributions with LiU’s professors Weimin Chen and Irina Buyanova. Congratulations to professor Charles Tu for this well deserved recognition his contributions to materials physics research at LiU. 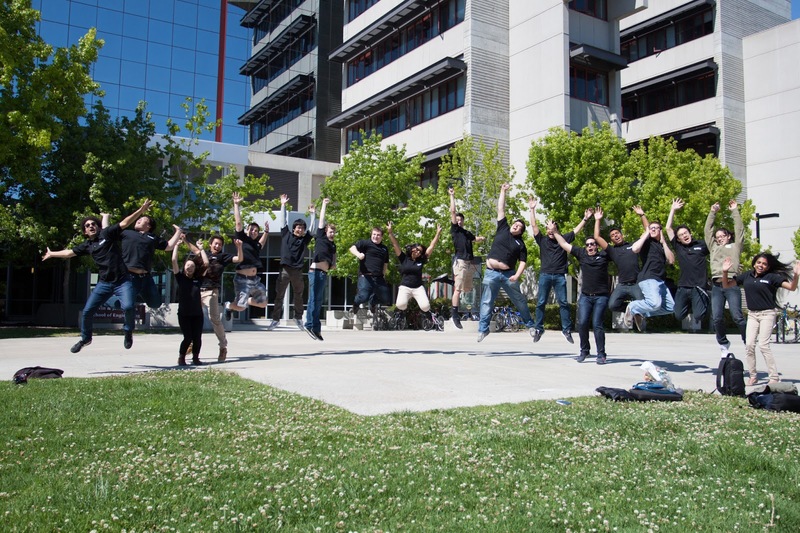 This collaboration first got started when Professor Chen was working in the University of California at Berkeley. Since Chen’s return to LiU in 1993, the cooperation has flourished and has covered a very wide range of materials research spanning from low-temperature MBE grown GaAs and InP for high-frequency devices, dilute nitrides for multi-junction solar cells and near-infrared lasers for fiber-optic communications, to ZnO nanorods for UV light emitters and sensors, self-assembled InAs/GaAs quantum dots for spintronics and quantum information, and GaP/GaNP core/shell nanowires for photonic applications. Read the press release from Linköping University. Tu is well known for advancing the field of molecular beam epitaxy (MBE), a method of depositing artificial crystals atomic layer by atomic layer that is used to build novel semiconductor hetero- and nano-structures for electronic, opto-electronic, and photovoltaic devices. He was ranked among the Most Cited Physicist by the Institute of Scientific Information (1997). 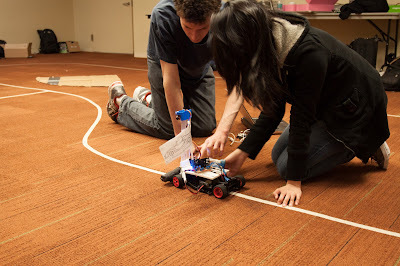 Tu is a Fellow of the IEEE, the American Physical Society, and the AVS Science and Technology Society. He was Engineering Educator of the Year in San Diego County in 2006, the recipient of Taiwan's Pan Wen-Yuan Foundation Outstanding Research Award in 2009, and the recipient of the North American MBE Innovator Award in2011. Charles Tu joined the UC San Diego faculty in 1988, and was appointed associate dean of the Jacobs School in 2004, after serving from 1999 to 2003 as chair of the ECE department. He was a distinguished member of AT&T Bell Laboratories technical staff from 1980 to 1988. He earned his Ph.D. in Engineering and Applied Science from Yale University in 1978. 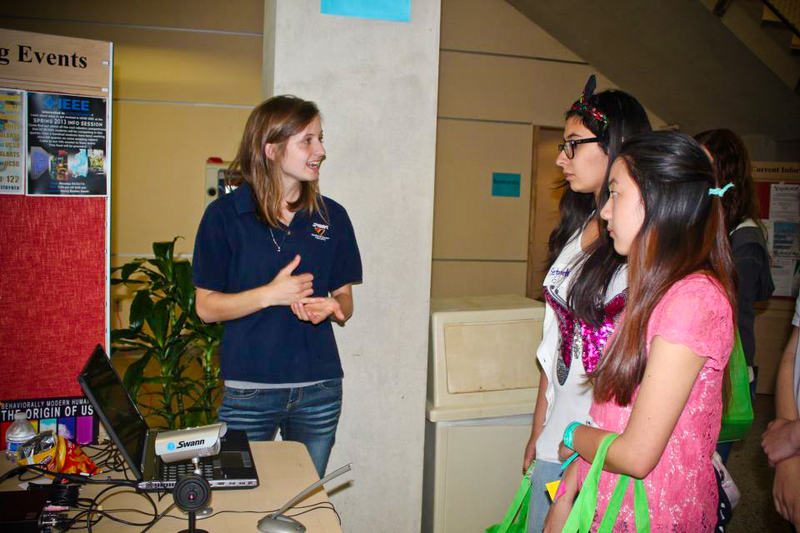 Sarah Esper, a graduate student in the Department of Computer Science and Engineering, has won an Outstanding Graduate Student Leader award from the UC San Diego Graduate Student Association. The award goes to an exceptional individual who has helped strengthen the graduate and professional student community at UC San Diego and improve the quality of the graduate and professional student experience. Esper will receive her award Tuesday, May 28 during a ceremony at The Loft. She was the graduate student president for Women in Computing at UC San Diego during the 2011-12 academic year. On the research side of things, she and fellow graduate student Stephen Foster developed CodeSpells, a video game designed to teach children how to program in Java. Check out the Triton 5K promo video...it's not the usual, garden-variety promo video. And if you thinking about doing the run...or getting into running in general and havn't read Born to Run, it's a fascinating page turner that will make you look at running in a whole new way. Find out more about the Triton 5K and register here. Registration closes May 31. 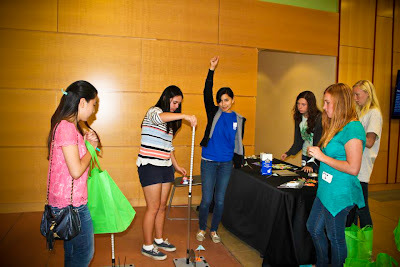 What pitted a green giant against an anteater at the Jacobs School of Engineering May 12? 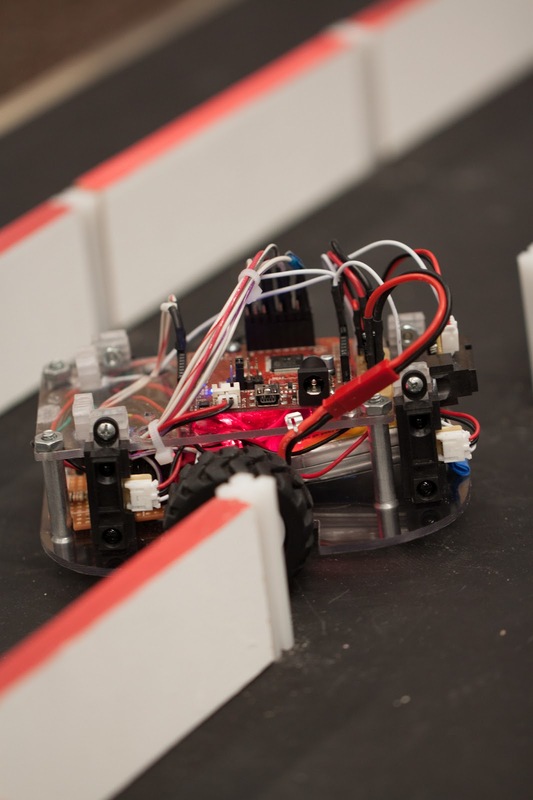 Why the 2013 California Micromouse Competition, organized by the UC San Diego chapter of IEEE. 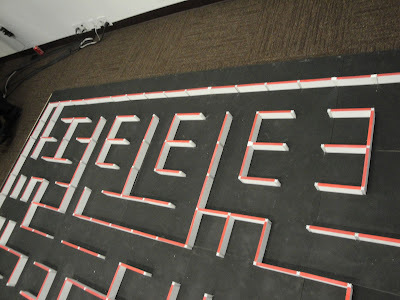 The mice's programming is geared toward solving a maze and finding its center—without getting a piece of cheese as a reward. 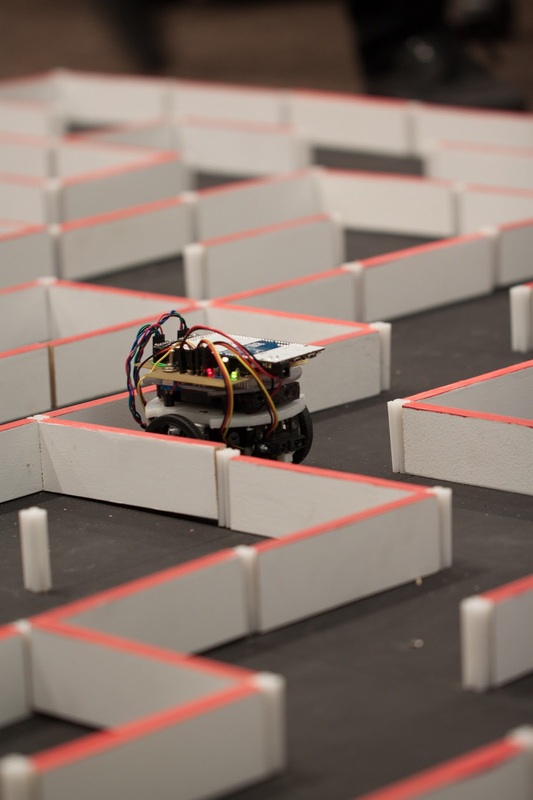 The mice are completely autonomous and the goal is to get to the center of the maze as fast as possible. They typically use a microcontroller and infrared sensors reflecting off the walls to make their way through the maze. 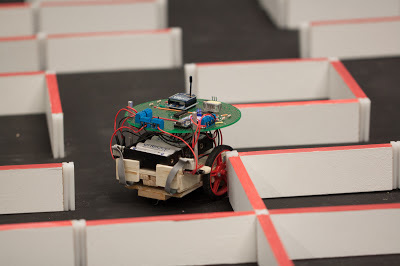 Some also use a wireless interface to transmit debugging data back to their team’s laptop. Most teams build the robots with off-the-shelf components. But some prefer to put together a custom circuit board, chassis and other parts. 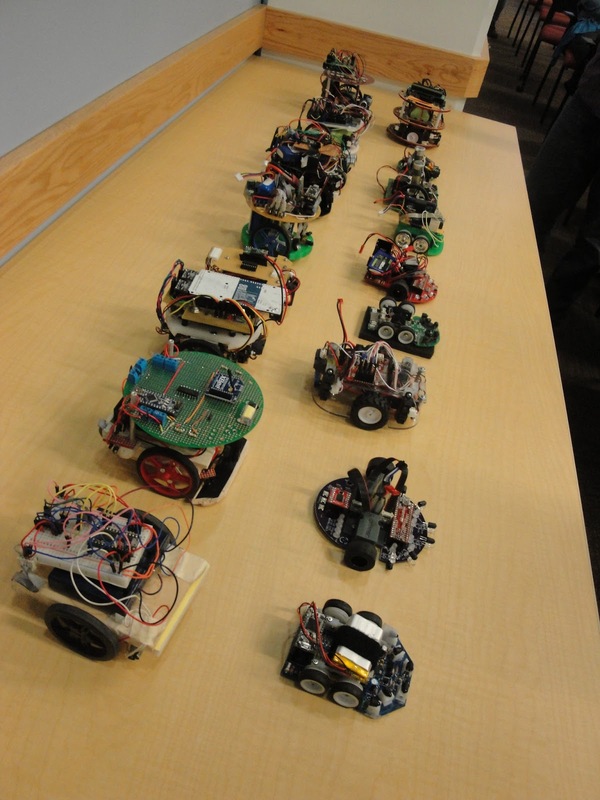 Many of the components students work on will be part of their future professional lives as engineers. Sunday, the Green Giants, UCLA's team, solved the maze in just 8.77 seconds. They were followed by the Anteaters, from UC Irvine, with 1 minute 5 seconds and by the Kansas State team with 3 minutes 47 seconds. Some pictures of the action below. 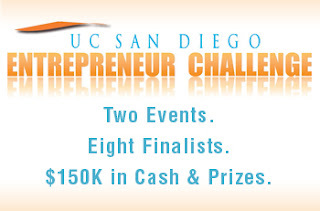 Two Business Plan competitions run by The UC San Diego Entrepreneur Challenge are coming up soon. Register (at no charge) for these great events via the links below and get the pulse of the innovation scene here in San Diego. 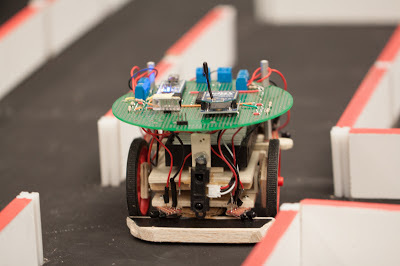 Side note: watch Raj Krishan from Biological Dynamics give a TEDx talk here. 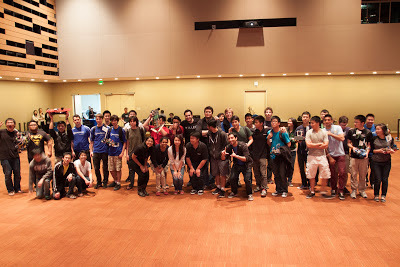 Entrepreneur Challenge “Elevator Pitch” competition from earlier this year. Alexander Vardy Named Jack Keil Wolf Chair in Electrical Engineering. Electrical engineering Professor Alexander Vardy, a renowned researcher in information and coding theory, has been appointed as the first Jack Keil Wolf Endowed Chair in Electrical Engineering at the University of California, San Diego. 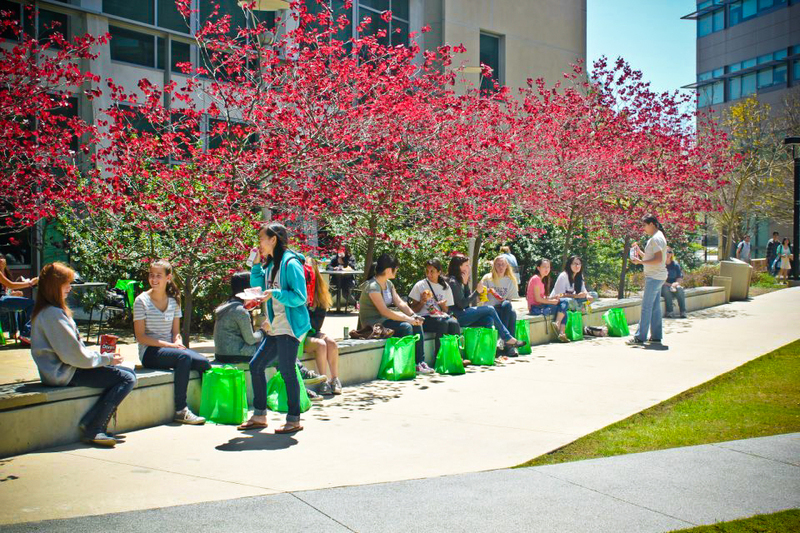 The endowed chair was established in memory of Jack Keil Wolf, a longtime professor at the UC San Diego Jacobs School of Engineering and a pioneer in information theory and its applications. The chair has been endowed with funds raised in honor and memory of Wolf’s lifetime of professional achievements in research and teaching. More than 50 people, including colleagues, former students, friends and family contributed to the fund. Vardy said the scope of the contributors is a tribute to Wolf’s impact in the lives of so many. Professor Alexander Vardy, Jack Keil Wolf Chair in Electrical Engineering. That flame, at least on the research side of Wolf’s legacy, is important in the fields of information theory and coding theory. Information theory is a branch of applied mathematics and electrical engineering concerned with transmitting data from point A to point B without error. Whether that data is images taken by a spacecraft on Mars or photos taken on your smartphone, it is converted into a sequence of ones and zeros and bundled into packets to transmit down the line. Claude E. Shannon, who developed the field of information theory in the 1940s and 50s, posited that it was possible to achieve what he called “channel capacity” -- that is, perfect data transmission which is both reliable and efficient. This Holy Grail of capacity -- that you could transmit data without error while sacrificing the bare minimum in storage space or transmission time -- has driven the research of coding theorists, including Wolf and Vardy, for decades. 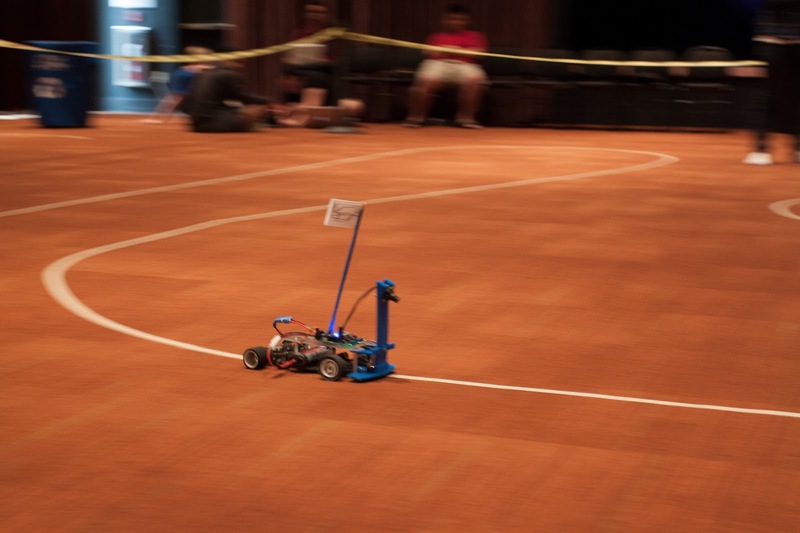 Teams from across Southern California competed in IEEE's Viacar contest April 28 in the Price Center Ballroom on the UC San Diego campus. 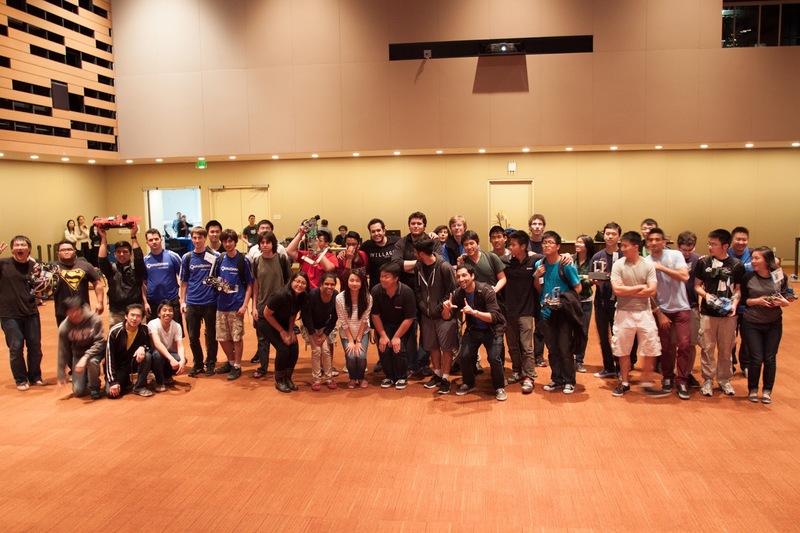 First place and second place went to two UCLA teams. 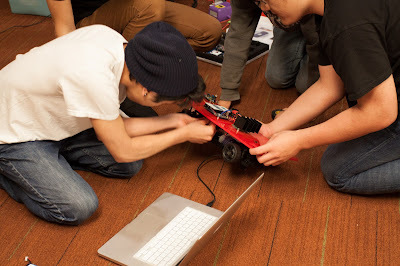 UC San Diego's Initial V team placed in third. 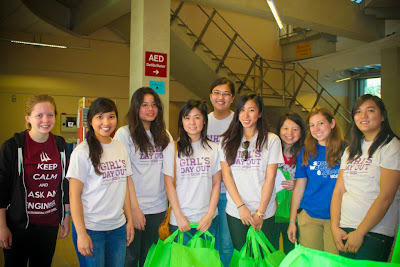 Students on the team were Victor Lee, Sebastian Sanchez, Kanza Khan, Komal Verma and Jenny Tu. 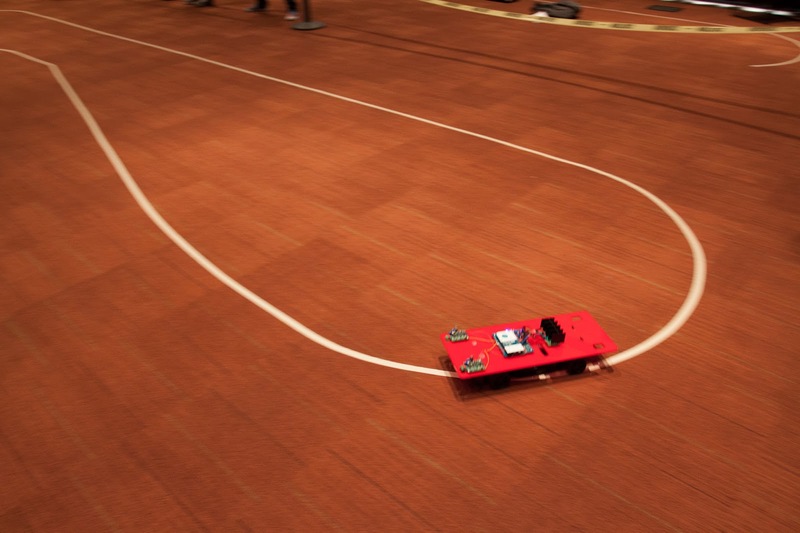 The goal of the competition is to design, build and race autonomous cars, which must follow a track marked by a one-inch white tape on a dark-colored carpet. Under the tape, there is a wire carrying a 100mA rms 75 kHz sinusoidal signal. The fastest cars travel at speeds of up to 10 feet per second. 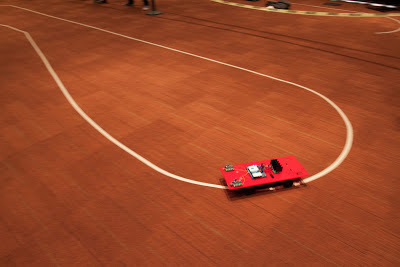 This year, the three fastest times were respectively 35, 38 and 38.3 seconds. 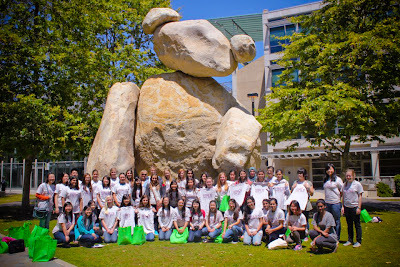 Postcards from the FRONTIERS OF SCIENCE...that's the name of a new blog from Janelle Shane, an electrical engineering graduate student here at the UC San Diego Jacobs School of Engineering. Janelle is part of the Ultrafast and Nanoscale Optics research group in the Electrical and Computer Engineering Department. "The edge of the unknown can be a strange and beautiful place. This land, the frontier of science, is the domain of the hardy brand of explorer known as the graduate student. Life here on the frontier is sometimes bizzare. ...and yes, we have lasers." Dramatic patterns of light and dark chase each other across the landscape. Jagged monoliths reach for the sky, while canyons, mesas, and mountains range on toward the horizon. 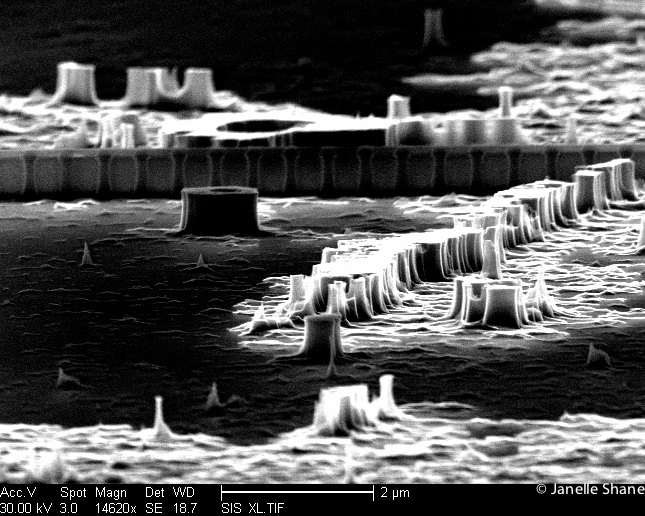 The mountains are made of solid laser material, and the plains are made of solid glass. 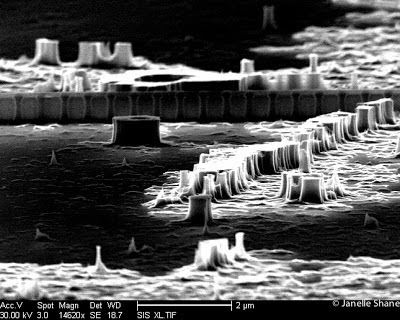 And it’s all microscopic, the tallest feature less than a hundredth as high as a human hair is wide. The Jacobs School of Engineering was in the spotlight on Yahoo's academic relations blog yoncampus.com twice in April. The blog highlighted a visit where researchers from Yahoo! Labs met with various Jacobs School faculty members, including Gert Lanckriet, Lawrence Saul, Todd Coleman, Sanjoy Dasgupta and Yoav Freund. Read the post here. A little earlier this month, Achint Thomas, a Yahoo! Labs researcher who worked on anti-abuse science, detailed his experience as a judge at Research Expo. Before the event, he met with CSE Prof. Ryan Kastner and Jason Oberg, one of Kastner's students, to talk about their novel work on theoretical assurances for hardware and system-level security. Read the post here. 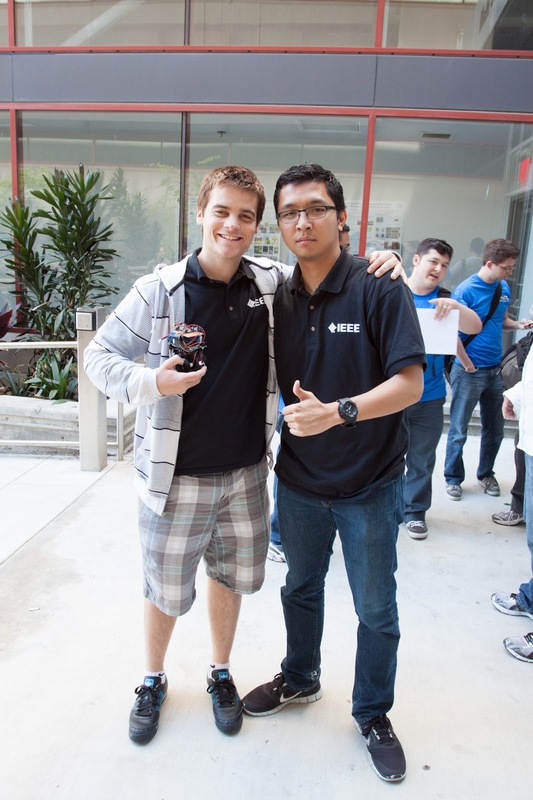 Rene Cruz, a professor in the Department of Electrical and Computer Engineering, and Cahit Akin, a former researcher in the UC San Diego division of the California Institute for Telecommunications and Information Technology (Calit2), founded Mushroom Networks to provide faster and more reliable internet connections for mission critical applications. App2you.com enables anyone to create custom web applications without having to do any programming. 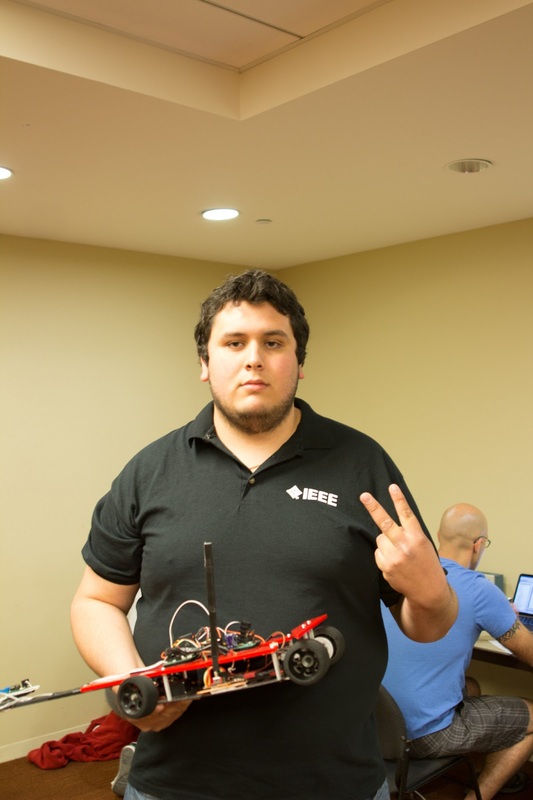 It was founded by Computer Science and Engineering professor YannisPapakonstantinou. ECE Professor Rene Cruz (second from left) shared his experience going through the commercialization process at a 10th anniversary celebration for the von Liebig Entrepreneurism Center. Cruz founded Mushroom Networks, which, along with app2you.com, has been nominated for the San Diego Business Journal's 2013 Innovation Awards. 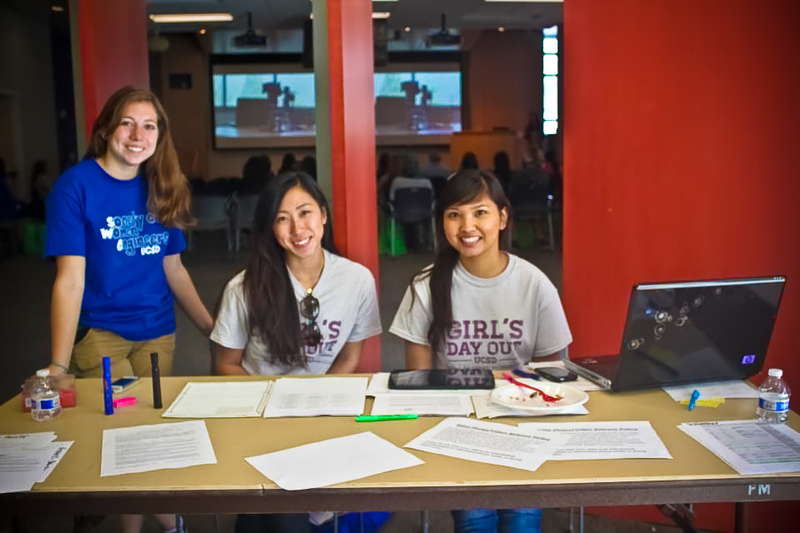 The Women in Computing student organization at UC San Diego, better known as WIC@UCSD, hosted its first Girl's Day out outreach event April 20 at the Jacobs School of Engineering. The goal was to attract more high school girls to the fields of computer science and engineering and information technology. Girls took lab tours, developed an Android app and listened to women who work in industry and academia. More info on the event here.